A team of researchers from the US and Taiwan made the first clear shot of a young star surrounded by an accretion disk. Astrophysicists have long believed that accretion disks formed around young stars serve as a “food source” for them, helping young stars to grow. In addition, from the material of the accretion disk, planets form with time. However, until now no clear image of the accretion disk has been obtained, since there were no methods for obtaining such an image. Now, thanks to the hard work done by this research team, as well as the unique capabilities of the ALMA radio telescope, this method has emerged. The unprecedented resolution of the ALMA radio telescope allowed researchers to consider in detail the young star called IRAS 05413-0104 (part of the HH212 system and having an age of only 40,000 years, according to estimates) around which the accretion disk rotates. It is believed that such disks consist of silicates, iron and other chemical compounds and elements characteristic of interstellar matter, and are the source of matter for a growing star. Since such disks have a three-layer structure with brighter outer layers, compared to internal layers, the researchers describe them as structures in the form of a hamburger. This picture allows one to substantiately refute one of the hypotheses about the impossibility of the existence around the star of an accretion disk, according to which the magnetic field originating from the center of the star turns out to be so powerful that it makes it difficult to rotate the accretion disk and practically stops it, depriving it of the ability to accumulate matter. The image shown here clearly demonstrates that this phenomenon is not actually observed. 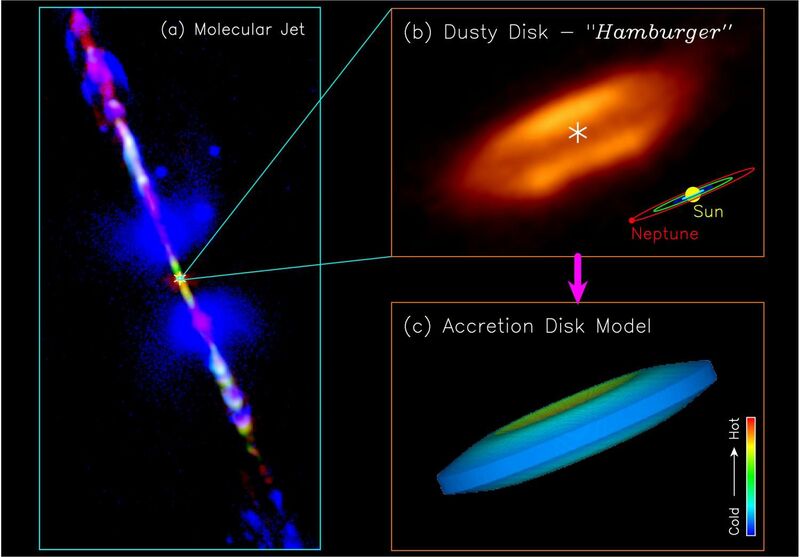 Also in the picture are gas jets emitted by a star that penetrate the “hamburger” in its central part.